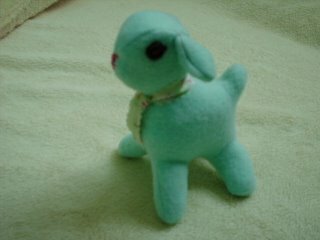 KIKA AND NINI DESIGNS: My very first softie! Has it been a month since I last posted? Busy with life, work, reading other blogs, and getting to know my sewing machine - made my first softie! It was a bear making this little lambkin. Guess it had to do with the fleece material I chose to make and being such a beginner. This pattern was soooo easy, however. The fleece material is a light minty-green color. I used brown buttons for eyes, pink embroidery thread for the nose, and made a little tie from the free Kitty-Craft material they give with your order because it's a little boy lambkin (also to hide unsightly stitches on the front). I'm so inspired I'm going to make another using a lighter cotton material. Well, what do you all think for my very first softie? Thanks, Jenn! I wanted to start off small, this is only 5-6 inches tall. I think I overstuffed it though. I like light green color too. Hey there! 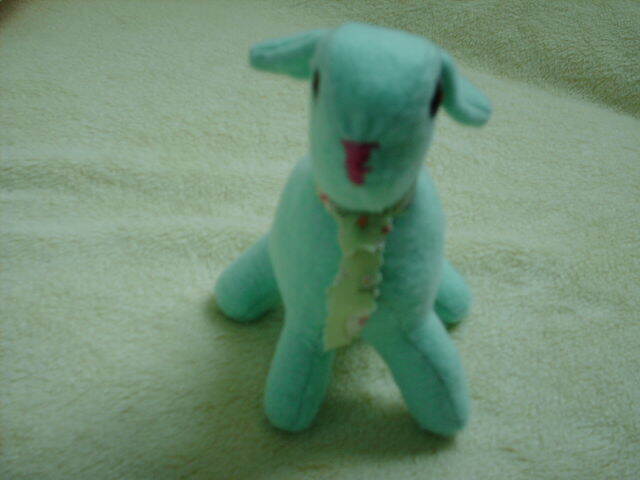 I think it turned out to be a very sweet lamb! Cute little friend. Well done for your first try. And thanks for putting up a link to my blog! Always appreciated. I've started a flickr group (Lambkin Stuffies) if you want to join and share it with the world. 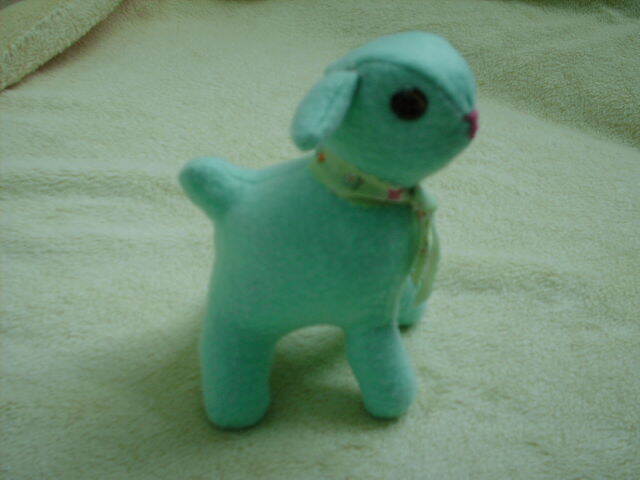 ismoyo & vicki - Thank you both for your kind words on my little lambkin, enjoyed making it. Vicki, I've joined and posted pics on your lambkin flickr group. I've linked to your blog and so love that wool puppy on your blanket statement page. So super duper sweet! Love him!